Bitreserve has launched Changemoney.org, a real-time visualisation tool to show its users how money is held, used and transferred on its platform. 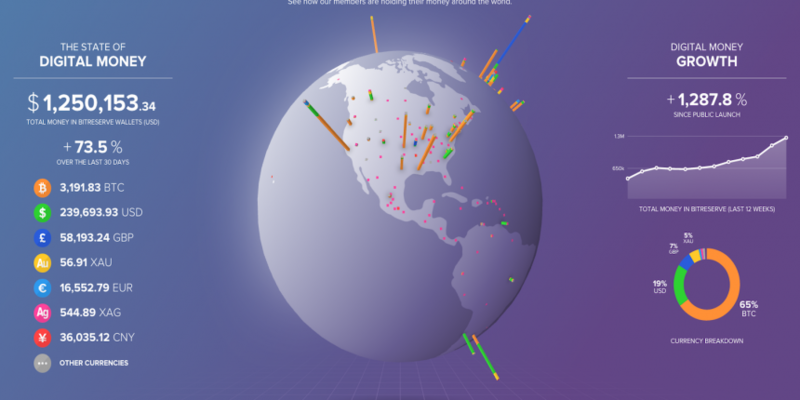 The microsite enables users to filter the results by currencies and plots the data on a 3D interactive globe, offering behind-the-scenes insight into activities. At press time, the site showed that the storage platform held $1,259,153 in bitcoin in its wallets. Speaking about the launch, Halsey Minor, founder and CEO, said that the new tool was in line what he believed to be the tenets of digital currency – inclusion, fairness and transparency. “Change money and the black-box model of today’s banking sector can be replaced with a glass-house model defined by real-time transparency,” he concluded. The platform has also added two more currencies, the Indian rupee and the Mexican peso, raising the total available to eight, after its introduction of the Swiss franc in February. The news comes after Bitreserve added three new precious metals to its bitcoin storage platform and five new languages – Mandarin, Japanese, English, Portuguese, Spanish and Russian. Having introduced gold last year, the site allows its users to hold bitcoin pegged to silver, platinum or palladium since last month. Bitreserve raised over $9m in a crowdfunding campaign earlier this year.